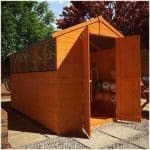 This reverse apex storage shed is a wonderful addition to the garden. Offering ample storage space and a stylish design, it will fit in practically any size garden. Created with overlap cladding, this is a good value building with a few noteworthy, great features. What’s unusual, yet great, about this small shed is that it comes with a pad bolt included. You’ll often find budget, entry-level sheds come with very little security. So it’s a definite advantage that Waltons have supplied a lock to keep your storage secure. One small, shatterproof window is provided and unlike the majority of sheds, it’s placed on the front of the building. Filtering natural light into the shed, the window also offers a more attractive design. A solid sheet floor is provided, which offers good support for light and medium weight storage. Despite being created with the cheapest style of cladding, the shed boasts a brilliant weatherproof design, capable of withstanding even heavy downpours. It also features a 10 year anti-rot guarantee for your reassurance. A large, wide ledge single door offers easy and spacious access into the building, whilst the mineral felt covered apex roof provides plenty of additional height. 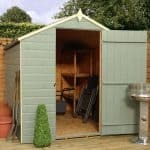 All in all this is a good value, yet strong and reliable storage shed that is sure to last for many years. Solid sheet materials may not be strong enough to support heavy equipment. However, Waltons do offer a support pack which can rectify this. This is an entry-level, wooden overlap storage shed. 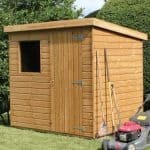 One of the smaller buildings in the range, it is suitable for general gardening equipment and tools and should fit into any garden. 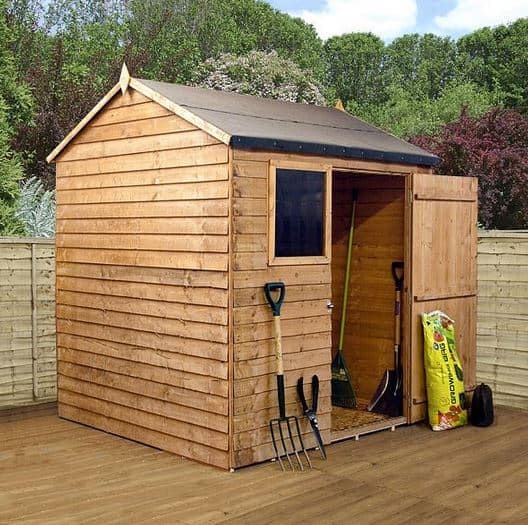 With a stronger floor, it could be used as a small hobby shed or workshop. Keep in mind that if you do want to use it as a workshop, you could need to install an electrical pack if you need a light source or power to work various tools and machinery. Due to the weakness of the cladding, an electrical pack isn’t recommended. Therefore we only recommend using this as a workshop if you plan on using battery powered tools and you only plan on working during daylight hours. Overall it is best used as a simple storage area. Whilst the roof isn’t as tall as some other similar buildings, what is noticeable is the extra tall eaves. They give the building a taller looking design. The fact the door also measures right up to the eaves helps to add to this taller illusion. It may not be as tall as some competitor sheds, but it still boasts an impressive height that allows you to comfortably manoeuvre around in and store taller equipment. The width of the door is also a great feature. It comes with an extra-wide design which also makes storing your belongings much easier. You won’t have to worry about struggling with bulky or heavy items and it also makes retrieving your stored items easier than ever. As the width and depth of the building are exactly the same, it creates a more symmetrical design. This not only makes it look more attractive, but it also ensures you have an even amount of space inside the building. This shed has a different style to the majority out there due to the alternate apex roof. It benefits from a horizontal, rather than a vertical design, filtering rainwater down the front and rear of the building, rather than the sides. It still offers the same great water-resistance benefits, it’s purely an aesthetic difference. It makes the shed look more like a tiny house and is great for those who are looking for something a little different. It’s manufactured with 8mm solid sheet board, so it isn’t the sturdiest roof you’ll come across. However, it is still able to withstand heavy winds and downpours. If you are concerned, we’d recommend installing roof joists to add a little extra protection. Covered with sand felt, the shed is perfectly capable of withstanding all weathers and will protect the building for years before it starts to perish. To keep with the budget design, the floor is also created from solid sheet board, measuring 10mm thick. Again, you may feel this is a little flimsy depending upon the type of storage you have. It’s sturdy enough to enable you to walk over the floor comfortably, as well as for medium weight equipment. However, we would advise adding the extra strength floor support kit if you want it to hold anything heavy. 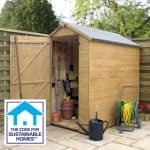 If you’ve done a little research into the different types of garden sheds available, you’ll know that overlap is considered to be the cheapest available. However, that doesn’t mean it doesn’t offer a good level of longevity. With this style of construction, the panels are built slightly overlapping each other, helping to create a strong, interlocking build. The main difference you’ll notice between this and tongue and groove or Shiplap cladding, is that the finish has more of a rough design. The panels aren’t completely smooth and there could be a risk of splinters. However, we feel this gives the shed a more authentic, rustic design. As we’d expect, Walton’s have used 8mm thick overlap. This tends to be the industry standard. However, the 28mm x 28mm framing adds extremely good structural protection. Whilst this is also a standard thickness, even on Shiplap designed sheds, for this style of cladding it offers much firmer support. One thing you do need to know about overlap cladding is that it is prone to warping if exposed to a lot of strong direct sunlight. So if possible, it would be a good idea to assemble this shed in the shade. It is vital you treat the shed either before assembly or very soon after. As highlighted earlier, overlap cladding isn’t the strongest material, which means it does need more maintenance than tongue and groove or Shiplap clad buildings. Spirit treatments are recommended as they provide much stronger water resistance. 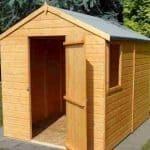 We tend to recommend these treatments anyway regardless of the type of wooden shed you buy. However, unfortunately with overlap you do miss out on one of the benefits of this type of treatment. With stronger clad buildings, spirit treatments do not always need to be applied every year. With overlap, you will need to treat them on an annual basis no matter which type of treatment you opt for. Whilst the regular treatments might be an added cost and annoyance, if you keep them up you will benefit from a 10 year anti-rot warranty. The shed comes with both a door and a window. The single door has quite a wide design, ensuring you have an ample level of space to carry equipment inside and outside of the building. It isn’t braced, but it does come with a ledge design which means you can install a hasp lock for better protection. The door is the only thing we’re slightly disappointed with. It doesn’t have the sturdiest look or feel, so we’d suggest bracing it yourself just to give it a little more stability and reducing the chances of it sagging. On the plus side, we do like the small 2.5mm styrene glazed window. Waltons have given it a slightly unique look, thanks to the wide frame that surrounds it. Whilst we feel the size of the building limits its need for a window as the lack of natural lighting wouldn’t really cause any problems, it’s still a nice attractive feature to have. The styrene glazing is also a nice addition as it is known to be safer than glass and is 100% shatterproof. If security and privacy are two of the most important features to you, we would recommend choosing a different model. Whilst you can improve the security of the shed, if you live in a high crime area we’d recommend opting for a Shiplap clad building. 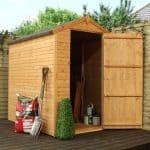 However, if your garden is secured and the public have limited view of the shed, the lack of privacy and security shouldn’t be much of a problem. One thing we will highlight is the pad bolt that is fitted to the door. If you invest in a padlock, you’ll be able to keep the building safe from amateur thieves. It’s mainly the overlap cladding that poses the biggest security threat. Saying that however, there aren’t many thieves that will take the time to hack their way through the walls of a shed. It’s just something to be aware of if you do live in an area with a high crime rating. The shed comes with 3 customisation options which are typically included with most of its buildings. The most notable in this instance is the extra strength floor support pack. This is an option we always recommend when a building comes with a solid sheet floor as standard. It comes with extra-thick joists that simply slide in between the standard joists, making it very simple to install. It basically adds stability as well as strength to the floor, making it capable of holding a lot more weight. If you aren’t storing anything heavy, you won’t necessarily need this upgrade, but it could still be worth adding to the building purely for your peace of mind. Treatments are another customisation option. As stated, the shed does require a treatment after construction so this is something you will need. How will it help you customise the building? 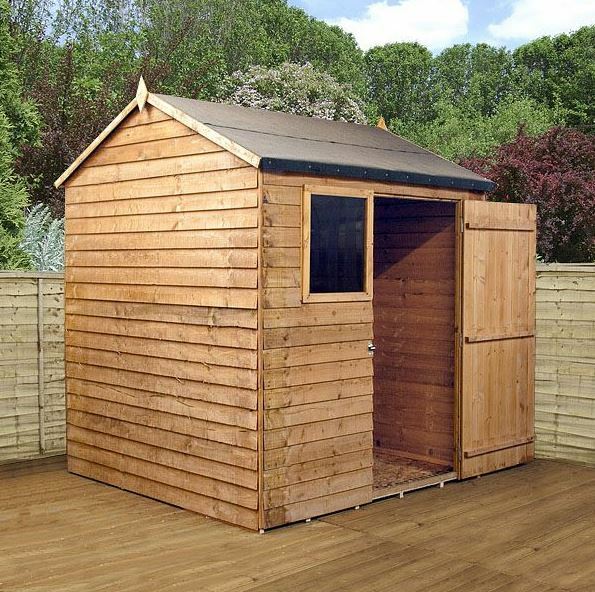 Waltons offer a wide choice of coloured treatments which help to give a completely different finish to the shed. For example, if you’re looking for a more dramatic change, you can use the Waltons Timber Treatment Cedar Red, or the Cuprinol Lavender colours. Alternatively you can give it a more neutral design and opt for the Cuprinol Country Cream. Now these are water treatments, but they could be used over the top of a spirit based treatment. The only thing with this is that the colour will dry slightly differently than it would if you just painted over the top of the timber. Then the last customisation option is the Superior Duty felt. We find that although the mineral felt included with the shed does provide adequate protection, it is slightly on the thin side. The Superior felt on the other hand is refreshingly thick and this is down to its strong fibreglass design. It isn’t known to perish over time like the mineral felt so you’re also lengthening the lifespan of the roof if you do invest in this upgrade. It’s also worth mentioning that the Superior felt is available in both charcoal and olive green colours. As well as the different customisation options, there are also 3 extras available. The 6×6 Portabase is the main one we recommend. To make sure the shed lasts as well as it should, it needs to be built on a very strong, flat surface. Concrete is preferable, but if you don’t have a concrete base then this Portabase is the next best thing. In fact, we’d even go as far as to say this is actually better. It boosts the building off the ground, thoroughly protecting it against damp. It also makes it a little easier to assemble the shed and ensures the entire structure is stable. A weatherproof padlock is also available, but it isn’t just your standard padlock. Waltons have created this 49mm padlock with a Thermoplastic weatherproof jacket, they’ve given it a double locking feature and it comes with a hasp and staple. As there is already a pad bolt on the door, this padlock will help to ensure your storage is safe from thieves. Draper accessories are the other extras available. However, the majority of customers won’t likely need them. Draper is one of the industry leaders in DIY and power tools. Waltons offer a 2 piece spirit level set and a cordless rotary drill. As it’s unlikely you will be using this as a workshop, these extras aren’t really needed. Even though the thinnest overlap cladding has been used on this shed, it does come with some great features. It also has a nice, attractive design. A lot of customers have been surprised at the high quality construction considering its low cost. Though not as long lasting as stronger clad sheds, the materials should still last for many years. This is only if you treat the building annually however. Being a small shed, your storage options are a little limited. However, there’s still plenty of room to store a wheelbarrow, lawnmower and any other garden essentials you may have. Just remember that the overlap cladding will not support the weight of interior shelving. It is the size of the shed which largely makes it a breeze to assemble. However, credit can also be given to Walton’s for including everything you need and ensuring it all fits together really easily. You should find it takes no longer than a few hours to construct with 2 people. This shed has been specifically designed with value in mind. The initial cost is extremely affordable, but you also get added value for money thanks to features such as the pad bolt and styrene glazed window. The only thing you have to consider is the regular annual treatments. Final Thoughts: One of the main things we like about this shed is its reverse apex design. 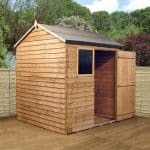 If you’re looking for something a little different to the usual modern sheds you can buy then this is an ideal choice. It doesn’t just look different – it also comes with many great features that a lot of similar buildings don’t. The pad bolt is a great example, as is the shatterproof window. Whilst the floor will need to be upgraded if you are storing anything heavy, it still offers a good, strong and stable design capable of withstanding even the harshest British weather. With regular treatments the shed will also be protected against rot for up to 10 years.